Our frog statue will surely add a delight serving as a unique speaker for the home or garden or even in an audio room. 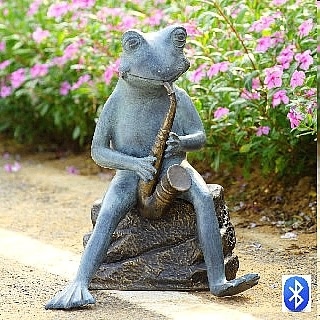 Created from aluminum, the frog statue which comes in the form of a saxophone player, is suitable for connection to any Bluetooth device. Bluetooth receiver and AC power cord. Allows for 1 play music from your cellphone or other Bluetooth device. 10 Watt speaker hidden in base. Dimensions: 20.5"H x 16.5" x 14"
Have you ever wondered if frogs can hear? Yes, they do. Although frogs do not have ears like us, they do have ear drums and an inner ear. If you look at a frog, you will notice a little circle behind the frog’s eye. That’s called the tympanum and it represents the ear of the frog. The eardrum is said to be connected to their lungs so that when the frogs croak so loud, it does not hurt their ear drums. The lungs will equalize the pressure differences between the outer surface of the eardrum and the inner surface of the eardrum thereby allowing the frog to make the loudest sounds possible.